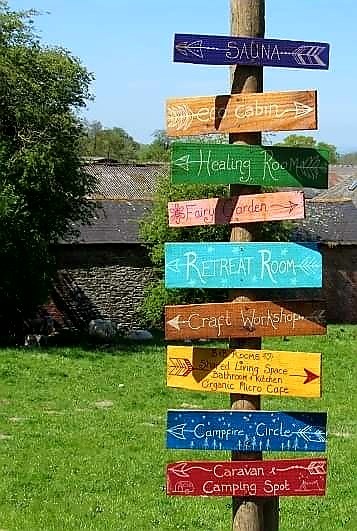 2019 Raw Magic Retreat Sep 20th-24th in Wales. More info and booking on Raw Living. Very limited spaces, email thetravellingpixies@yahoo.co.uk to reserve your place. Surrender to the change of the seasons! Take time out to be fully catered and looked after by Kate and her team. Meditate on what the year has brought you so far, and what you wish for the closing of the year. Take a weekend to restore your energies, ready for the last quarter of 2019. Our venue is a beautifully peaceful little spot nestled in the Welsh hills. You are unlikely to meet anyone but sheep if you take a walk! Maybe just a friendly local driving by, who will ask if you need a lift anywhere. Enjoy raw vegan cuisine at its highest level, fun and educational workshops, and a whole bunch of new like-minded friends. Kate has hosted and catered for retreats worldwide, including Costa Rica and Hawaii. Most notably, she worked with Bristol’s Anna Middleton and they created a UK health retreat like no other, where the emphasis was on relaxation, nurturing, fun and friendships. Kate and Anna hosted five sold-out Raw Magic Retreats together in Somerset and Hereford. If you would love to have Kate host a retreat at your venue, or you would love to have her cater for your retreat group, please contact kate@rawliving.eu. Kate do you ever have any classes or retreats in the New York city area USA? Hi Kate, do you know if you will have any Raw retreats this year..? any locations you have in mind..? hi louise, i don’t have anything planned this year im afraid. i am doing events here in london. we are planning Bali for Jan 2019. thanks for your interest. Kate. Do you have any events coming up in the USA? East coast or New York areas? I think there may be enough interested folks to do such an event. hi i will be doing hawaii in august if thats any good 2u?